This edition of Booklights honors Mitchell College’s commemoration of Earth Day in this 75th anniversary year of the institution’s founding, showcasing titles that challenge us to reflect on the impact of human activity on the Earth and its climate. These and additional titles are on display in the Library. 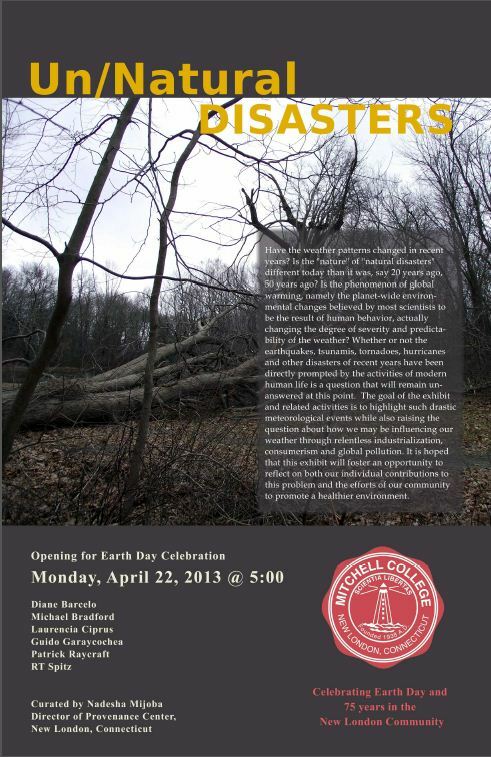 On April 22, 2013, the Library will host a number of Earth Day events following outdoor opening ceremonies centered on the preservation of Mitchell Woods and Mitchell Beach. View full press release. Library programming will include student presentations and poster sessions, the dedication of an art work created for the Library by artist Diane Barcelo, and the opening of the Library’s Earth Day exhibit, Un/Natural Disasters, curated by Nadesha Mijoba of the Provenance Center in New London, CT.
Silent Spring turned 50 on September 27th, 2012. Many scholars and scientists point to the realization in the 21st century of Rachel Carson’s worst fears for the environment and to the urgency for global action. Visit the library’s book display to browse this and other works by and about Rachel Carson.